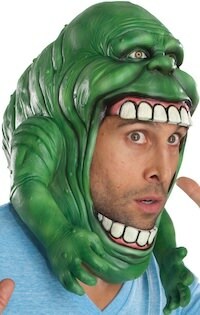 If you want a to scare away some ghosts then you can do so by wearing this Ghostbusters slimy logo backpack. The backpack is black but on the front it has a red top part with in neon style the famous Ghostbusters logo and then below that it looks like there is green slime leaking from the pocket. The backpack has a couple pockets and a laptop sleeve and is measures 17 x 12 x 5.75 inches and that makes it nice and big for all you school work or maybe office supplies or things to take on an adventure. Now you just need to adjust the straps for your body and you are ready to go.